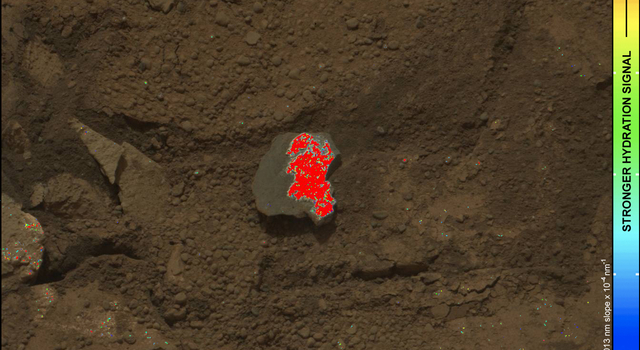 THE WOODLANDS, Texas - NASA's Mars rover Curiosity has seen evidence of water-bearing minerals in rocks near where it had already found clay minerals inside a drilled rock. 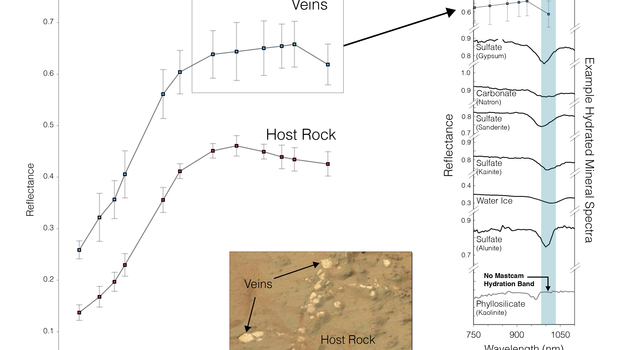 Last week, the rover's science team announced that analysis of powder from a drilled mudstone rock on Mars indicates past environmental conditions that were favorable for microbial life. 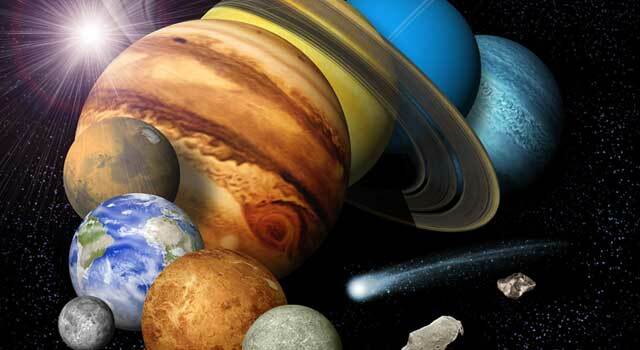 Additional findings presented today (March 18) at a news briefing at the Lunar and Planetary Science Conference in The Woodlands, Texas, suggest those conditions extended beyond the site of the drilling. Using infrared-imaging capability of a camera on the rover and an instrument that shoots neutrons into the ground to probe for hydrogen, researchers have found more hydration of minerals near the clay-bearing rock than at locations Curiosity visited earlier. 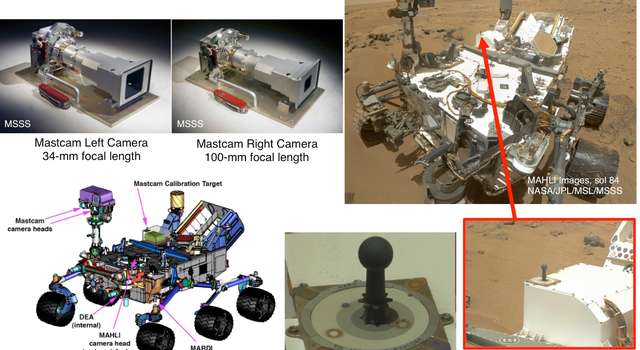 The rover's Mast Camera (Mastcam) can also serve as a mineral-detecting and hydration-detecting tool, reported Jim Bell of Arizona State University, Tempe. 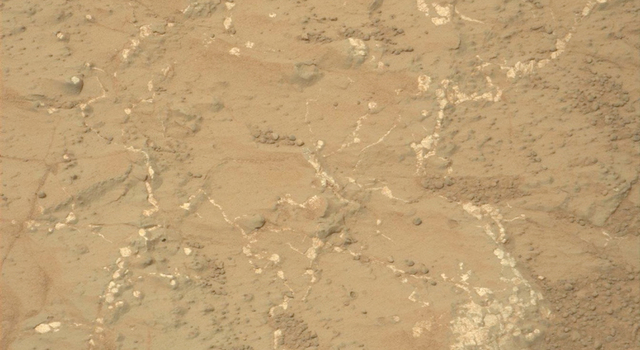 "Some iron-bearing rocks and minerals can be detected and mapped using the Mastcam's near-infrared filters." 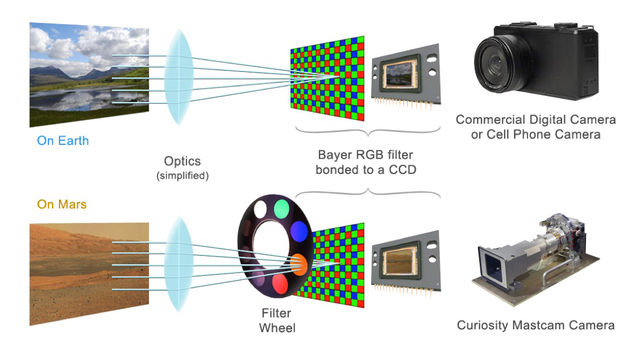 Ratios of brightness in different Mastcam near-infrared wavelengths can indicate the presence of some hydrated minerals. 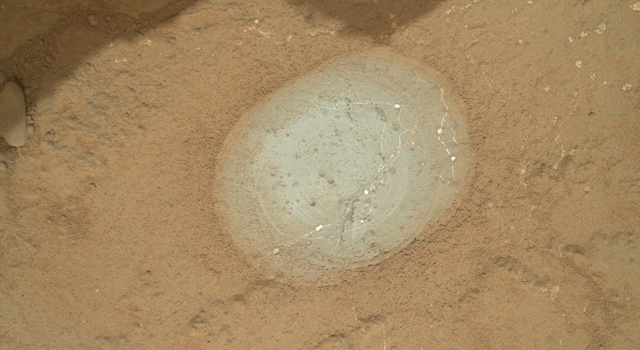 The technique was used to check rocks in the "Yellowknife Bay" area where Curiosity's drill last month collected the first powder from the interior of a rock on Mars. Some rocks in Yellowknife Bay are crisscrossed with bright veins. 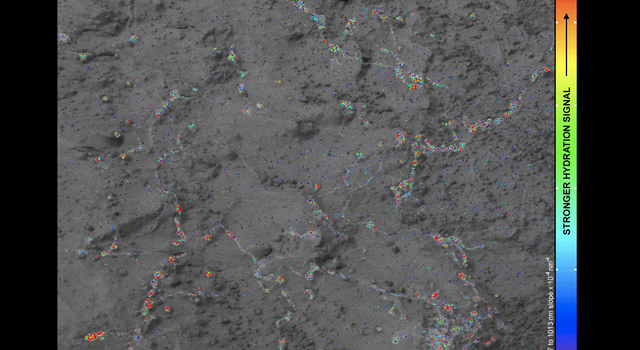 "With Mastcam, we see elevated hydration signals in the narrow veins that cut many of the rocks in this area," said Melissa Rice of the California Institute of Technology, Pasadena. "These bright veins contain hydrated minerals that are different from the clay minerals in the surrounding rock matrix." 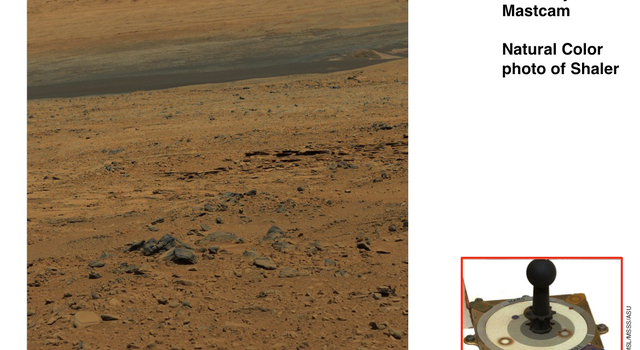 The Russian-made Dynamic Albedo of Neutrons (DAN) instrument on Curiosity detects hydrogen beneath the rover. 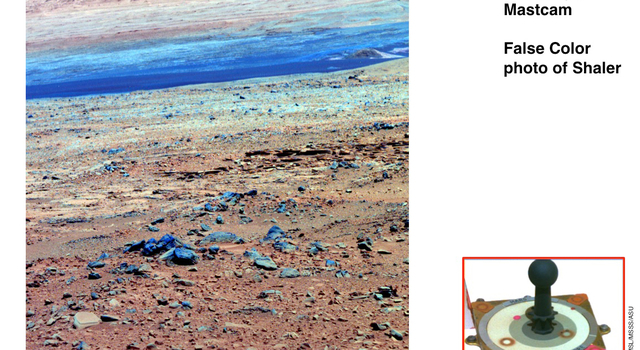 At the rover's very dry study area on Mars, the detected hydrogen is mainly in water molecules bound into minerals. 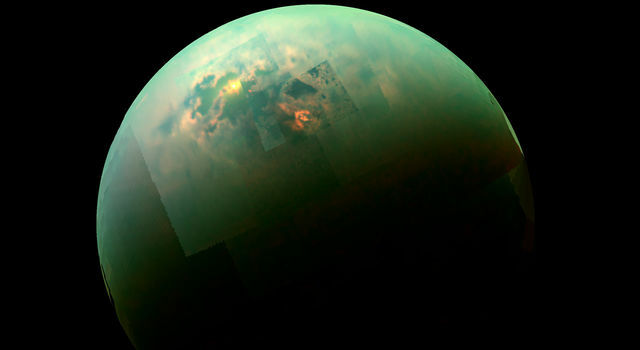 "We definitely see signal variation along the traverse from the landing point to Yellowknife Bay," said DAN Deputy Principal Investigator Maxim Litvak of the Space Research Institute, Moscow. "More water is detected at Yellowknife Bay than earlier on the route. 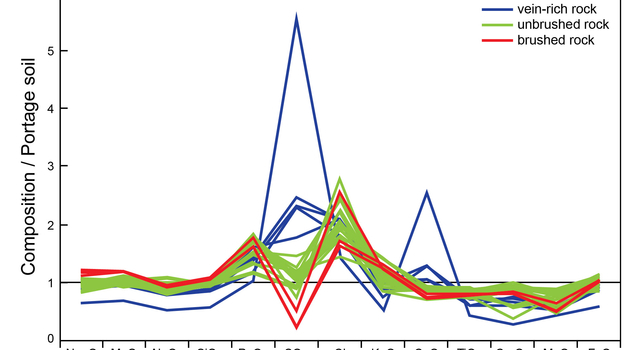 Even within Yellowknife Bay, we see significant variation." 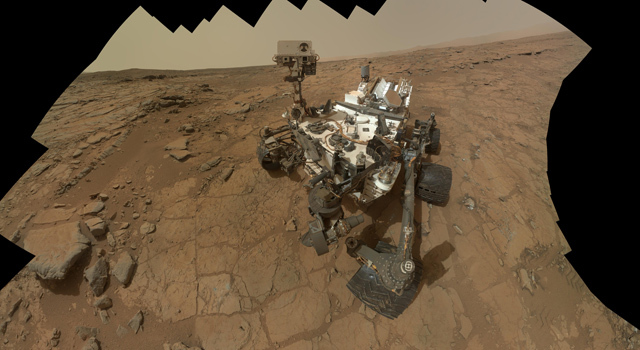 Findings presented today from the Canadian-made Alpha Particle X-ray Spectrometer (APXS) on Curiosity's arm indicate that the wet environmental processes that produced clay at Yellowknife Bay did so without much change in the overall mix of chemical elements present. 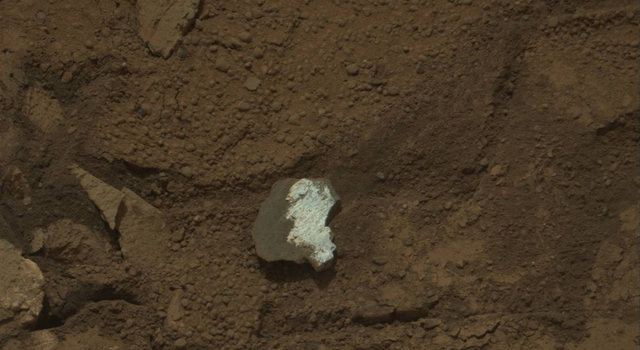 The elemental composition of the outcrop Curiosity drilled into matches the composition of basalt. For example, it has basalt-like proportions of silicon, aluminum, magnesium and iron. 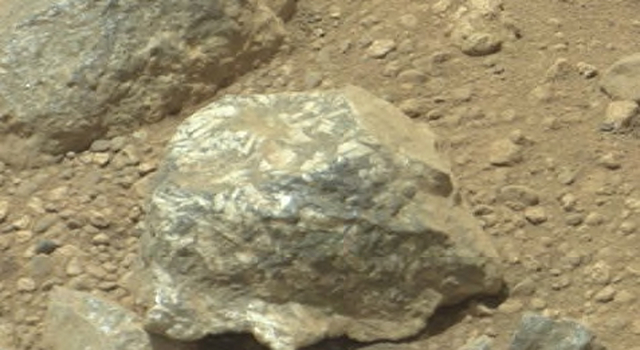 Basalt is the most common rock type on Mars. It is igneous, but it is also thought to be the parent material for sedimentary rocks Curiosity has examined. "The elemental composition of rocks in Yellowknife Bay wasn't changed much by mineral alteration," said Curiosity science team member Mariek Schmidt of Brock University, Saint Catharines, Ontario, Canada. 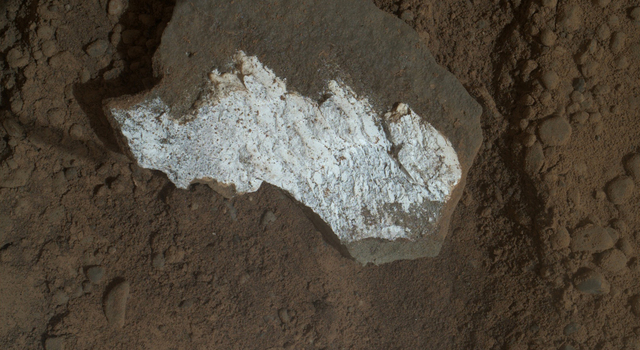 A dust coating on rocks had made the composition detected by APXS not quite a match for basalt until Curiosity used a brush to sweep the dust away. After that, APXS saw less sulfur. "By removing the dust, we've got a better reading that pushes the classification toward basaltic composition," Schmidt said. The sedimentary rocks at Yellowknife Bay likely formed when original basaltic rocks were broken into fragments, transported, re-deposited as sedimentary particles, and mineralogically altered by exposure to water. 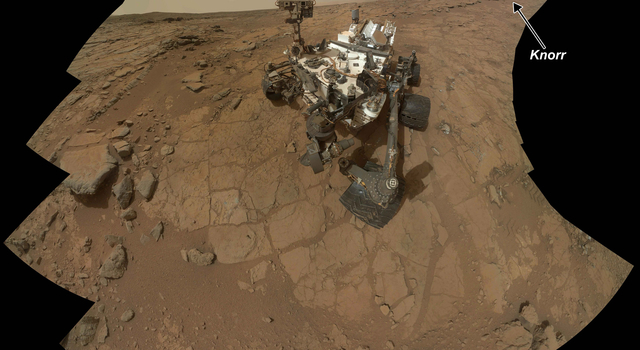 NASA's Mars Science Laboratory Project is using Curiosity to investigate whether an area within Mars' Gale Crater has ever offered an environment favorable for microbial life. Curiosity, carrying 10 science instruments, landed seven months ago to begin its two-year prime mission. NASA's Jet Propulsion Laboratory, Pasadena, Calif., manages the project for NASA's Science Mission Directorate in Washington. 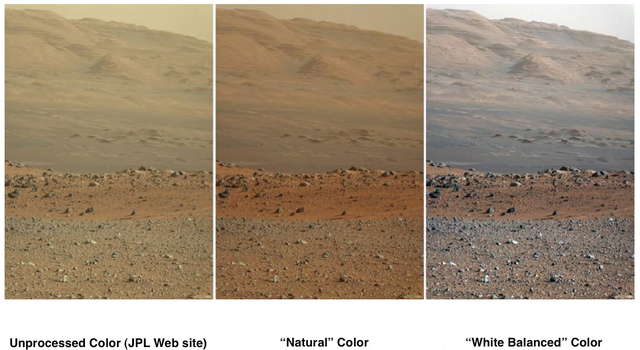 For more about the mission, visit: http://www.jpl.nasa.gov/msl , http://marsprogram.jpl.nasa.gov/msl and http://www.nasa.gov/msl .